Do you make your bed? Do you eat breakfast? Do you have more than 5 minutes of alone time during the day? These might each seem like insignificant details in the grand scheme of your busy life, but small daily rituals can have a big impact on your energy. 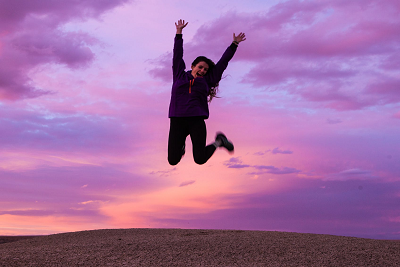 If you’re feeling low on energy and could use a boost, consider adding these 5 daily rituals to your routine, and improve your energy immediately. We hear all the time about how important it is to eat breakfast. Did you know that it’s not just great for your health, but a key factor in the amount of physical and mental energy you’ll have for the day? Not only does eating a healthy breakfast fuel your body and help your mind to perform better, this simple daily ritual is a part of a bigger self-care routine which will improve your energy levels and help to prepare your mind and body for the day ahead. Start eating a healthy breakfast every morning and watch your energy (and your outlook) change for the better. Have you ever stopped to calculate how long you spend looking at screens each day? Between your phone, your computer, the television and your tablet, you could be clocking up a staggering amount of time ‘switched-on’. 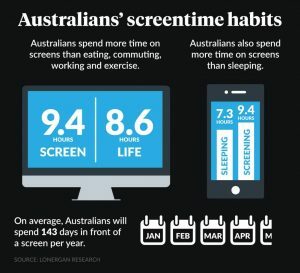 The average Australian spends more than one third of their day exposed to a screen. For office workers, this jumps from 9.4 hours to 11.4 hours per day. That’s more time than we spend sleeping! What does that mean for our energy levels, you might ask? Make your bed each morning. You will be grateful tonight! Switch off the TV and devices at least 30 minutes before you head to bed, to give your brain time to wind down from the stimulation. Avoid taking screens into the bedroom (this includes tv, laptops, tablets and phones). Practice some simple breathing exercises when you jump under the covers, to help relax your mind and body ready for sleep. Keep your phone away from the bed, to avoid being tempted to check it, and to avoid the health risks associated with EMF radiation emitted from your phone! Use a separate alarm clock which isn’t your mobile phone (for the same reasons as above). Listen to soothing music or a guided meditation for 30 minutes before sleep. This also helps your brain to wind down and can assist with a deeper sleep at night. Around two thirds of all adult Australians don’t get enough exercise, according to the Heart Foundation. Exercise isn’t just crucial for keeping our bodies healthy and our weight under control, it’s also important for improving our energy levels. How? According to Robert Gotlin, DO, a specialist in medicine at Lenox Hill Hospital and Mt Sinai Hospital in New York, exercise increases both the body’s fitness and improves mood: both of which lead to a boost in energy. Getting up from your desk once an hour and taking a short walk or doing a couple of laps of the stairs. Take the time to stretch at least every 15 minutes at your desk (this will help to improve your posture and prevent you feeling sluggish). Take the stairs instead of the lift whenever possible. Park a short distance from the office, school drop-off zone or grocery store and walk the rest of the way. Include some weight lifting or strength training exercises such as lunges, planks or squats in your down-time routine, such as when in front of the TV or even when taking a call at work. Incorporate some High-Intensity Interval Training (HIIT) in your week – highly effective short workouts with amazing health benefits! Today I am going to achieve everything on my to-do list. Today I am going to be productive and feel accomplished. I am capable, confident and in control of my day. You’ll be surprised at just how quickly your gratitude journal and declarations will make a difference to your energy levels. By adding each of these daily rituals to your routine, you’ll see your energy levels boosted and your overall outlook improved. If you could use some extra help with creating daily rituals which improve your energy levels, you might consider seeing a life coach who can put together a tailored plan for you. At Integrated Health Specialists, our solutions-focused programs have helped many Australians to overcome their hurdles, improve their energy levels, and reach their full potential. Reach out today for more information.